Paramo says:"A water-repellent, insulating windproof fleece jacket from Paramo. Lightweight and lower bulk, the Tiempo Fleece is ideal for use on and off the hill. Effective windproofing allows greater warmth to be trapped in the underlayers reducing heat loss from windchill - an advantage when trying to stay warm or to warm up. Recommended for low level rambling and a wide variety of Trek and Travel climates. The Tiempo is perfect for everyday use and has already become a firm favourite amongst P�ramo staff." Increased field of vision provided by a fully adjustable, wired and detachable low profile hood. Camera, compass or other essential storage provided by large zipped chest pocket. Adjustable temperature and weather protection from the high collar with single-hand drawcord adjustment. Temperature adjustment from elasticated and poppered cuff. Handwarming and additional storage from two waist level pockets. Venting, weather protection and minimal rucking provided by concealed, elasticated waist and hem drawcords. Protection to the kidney area when bending or stretching from scooped tail. Lightweight and low bulk - takes up limited space when packed. 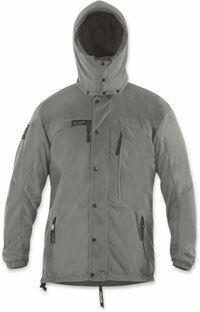 For maximum weather protection combine with the Fuera Windproof Smock or Jacket. The Windproof lining may feel unfamiliar at first but allows the jacket to be worn across a greater range .of temperatures as well as giving greater flexibility and versatility. I've used the Paramo Tiempo fleece over a base layer on a variety of low level walks in Derbyshire and Cheshire during late summer/autumn. I also took it with me on several summer camping trips to Scotland. Material: The material has a soft velvety feel to it - quite unlike the material more usually used for fleeces. It also has a rather interesting silky-feeling lining. These two have been combined to make a very light and comfortable garment. I've worn it in quite windy conditions and it certainly kept the wind out. It also performed well and kept me warm when walking through cloud and mist on the mountain tops (most notably on Braeriach in the Scottish Cairngorms) as it does have some water-repellancy. However, when it started to actually rain I had to put on a proper waterproof jacket to keep everything dry. Fit/Design: It's a good length and the scooped tail design means that your lower back stays covered even when wearing a reasonably sized back-pack. There's a chunky two-way zip which was consistently easy to use. The articulated shoulder design provides good freedom of movement when stretching. The temperature control options are varied. The sleeves have a popper fastening which I personally much prefer to an elasticated cuff. The hood/collar have a number of adjustment options and combine to create either a loose or snug fit around the neck depending on your needs at the time. The Paramo Tiempo seems to offer all the functionality of the Paramo Tiago but it's much, much lighter and much less bulky.